Click to see Bagrationi Coat of Arms in detail. 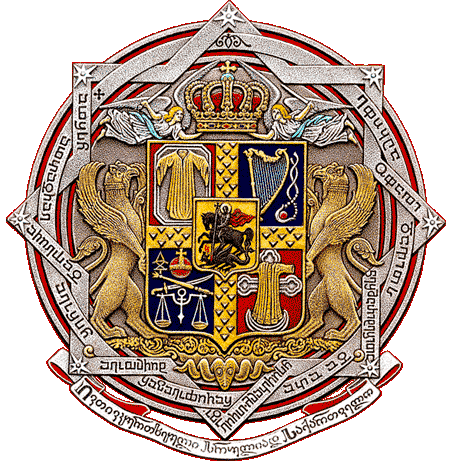 The claim that the Georgian Royal Bagrationi Dynasty is of a Hebrew origin and descended from the Biblical King-Prophet David dates back to the arrival of the Bagratid family on Georgian soil, (from Armenia), in the latter half of the eight century, but has its origins in the writings of the Armenian historian, Movses Khorenatsi, (410-490). As Bagratid power grew, (cf. Bagrat - derives from the Old Persian Bagadāta, meaning God-Given), this claim morphed into an officially endorsed paradigm, enshrined in medieval historical literature such as the early eleventh-century chronicle of Sumbat Davitis-dze, and formed the basis of the dynasty's political ideology for the duration of their millennium-long ascendancy in Georgia. Davidic descent allowed the Bagrationi to claim kinship with the Lord Jesus Christ and the Virgin Mary and rest their legitimacy on a Biblical archetype of God-anointed royalty. The earliest extant Georgian reference to the Davidic origins of the Georgian Bagratids is found in Juansher's historical work, (written between 800 and 813), in which he describes the arrival in Kartli, a core Georgian region, sometime after 772, of Adarnase, "who was of the House of David the Prophet". The Life of St. Grigol Khandzteli, written in 951 by the Georgian hagiographer Giorgi Merchule, is next to refer to the tradition of the Davidic origin as extant at the time of Ashot I, Adarnase's son and the first Georgian Bagratid monarch, whom the monk Grigol addresses as "Lord, called the son of David, the Prophet and God-anointed". The narrative was confirmed in the 45th Chapter of the treatise De Administrando Imperio, written c. 950 by the Byzantine Emperor Constantine VII Porphyrogenitus. According to Constantine, the Georgians believed they were descendents of Uriah's wife Bathsheba, with whom King David committed adultery, and who had children by him. Thus, they claimed to have been related to the Virgin Mary, inasmuch as she was also descended from David. The fullest expression of the Davidic claims of the Georgian Bagratids in Georgian literature is preserved in the eleventh-century Life and Account of the Bagratids by Sumbat Davitis-dze, (i.e., Sumbat, son of David). This work, which has come down to us as part of the larger compendium known as the Georgian Chronicles, contains the most elaborated version of the Bagratid family history. Sumbat's history commences with a lengthy stemma, tracing the ultimate origin of the Georgian Bagratids from Adam through King David down to Joseph, husband of the Virgin Mary; and then from Cleopas, brother of Joseph, to a certain Solomon, whose seven sons left the Holy Land and went to Armenia, where a certain Queen Rachael had them baptized. Three of them remained in Armenia and their offspring later ruled that country, while the four brothers arrived in Kartli. One of them, Guaram, was made a ruler there and became, the forefather of the Bagrationi. Guaram's brother Sahak established himself in Kakheti, while two other brothers, Asam and Varazvard, conquered Kambechani, east of Kakheti, from a Persian governor. 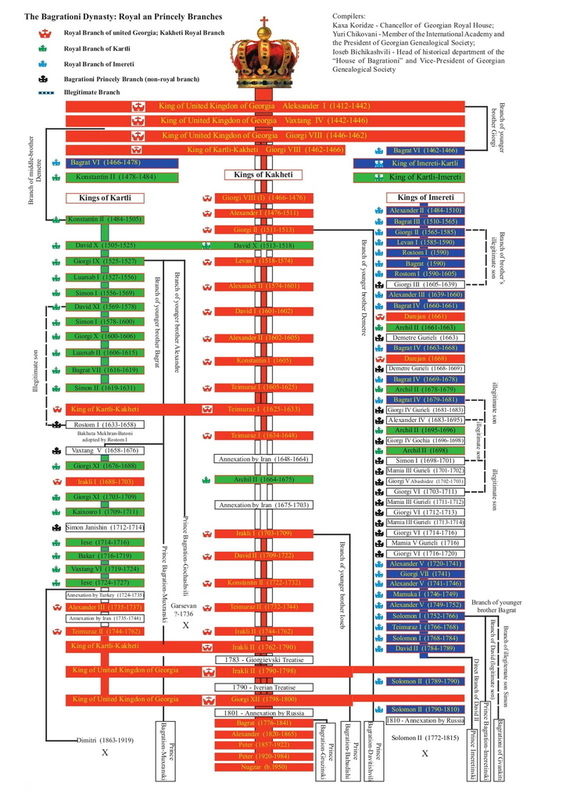 Sumbat's genealogy from Adam to King David is based on the Gospel according to Luke (3:32), while the one from King David to Joseph is from the Gospel according to Matthew (1:1-16). The source of the genealogy of Cleopas and his descendants is apparently the Roman scholar Eusebius of Caesarea, who, in his Ecclesiastical History, quotes Hegesippus, according to whom, the Romans searched for King David's descendants in order to remove from the Hebrew territory any potential pretenders to the throne who had Biblical legitimation. By including Cleopas into the Bagratid genealogy, Sumbat purposefully led the dynasty's ancestry to the God-anointed King of Israel. Thus, Sumbat's work contains the version of the family history, which became the basis of a dynastic and political ideology, and, in the course of history, influenced the worldview of the Bagrationi dynasty, (see Genealogy of the Bagrationi Dynasty according to Sumbat). Beside the textual sources, the legend of the Bagratids' Davidic origin is enshrined in the stone effigy in low relief from the medieval Georgian monastery of Opiza, in Shavsheti, and now on display at the Art Museum of Georgia in Tbilisi. The sculpture represents a nobleman in an act of offering a Church to Jesus Christ, seated upon a throne, blessing the donor, and accompanied by a man with his hands in a gesture of supplication. Based on the accompanying minimal Georgian inscriptions, the relief is traditionally interpreted by Ekvtime Taqaishvili, Ivane Javakhishvili, and Cyril Toumanoff as a contemporary depiction of the curopalates Ashot I, (died 830), with Christ and the Biblical King David. Toumanoff, for example, was convinced that here "the allusion to the donor's descent from Our Lord's ancestor and the latter's intercession is unmistakable". The art historian, David Winfield, also argued that the presence of the six-pointed star in medieval Georgian architecture, such as on the 10th-century church Doliskana, in Klarjeti, alluded to the descent of the Bagrationi from King David. Subsequent historical works refer on many occasions to the dynasty's Biblical provenance. An 11th-century anonymous historian and author of the Chronicle of Kartli mentions, while relating the event on the eve of the Georgian Bagratid accession to power, the Davidic tradition as existing at the time of Ashot I's father Adarnase. Another Georgian chronicle, the anonymous Life of King of Kings David, written c. 1123–1126, declares its subject, King David IV of Georgia, (1189–1225), to have been the 78th descendant of his Biblical eponym. Later, the chronicle compares David IV's coronation of his son, Demetrius I, prior to the former's death, to that of the Biblical David's enthronement of Solomon and once again emphasizes the "resemblance to his ancestral stock". A contemporaneous versified dedicatory inscription on the venerated icon of the Mother of God, known as the Khakhuli Triptych, which mentions David IV and Demetrius I, compares the Virgin Mary's Davidic descent to that of the Georgian Bagratid monarchs. The Biblical lineage was also reflected in the later dynastic surname Jessian-Davidian-Solomonian-Bagrationi, not infrequently encountered in the Bagratid documents. The symbols associated with David, a harp and sling, appear in Bagrationi heraldry. Finally, the eighteenth-century Bagratid historian Prince Vakhushti incorporated the Davidic theory into his chronology, while his father, King Vakhtang VI of Kartli, composed a family tree, integrating the Biblical lineage of the Bagrationi with that of the Georgian people, the origins of which was traced by the medieval chronicles to Togarmah, a descendant of Noah. Prince David of Georgia, a son of the last King of Georgia, writing in the early years of the 19th century, shortly after the dethronement of the Bagrationi by the expanding Russian Empire, summarized the Davidic origin of his family, being the first to have directly incorporated in his history, written in Russian, the original Armenian account of a Hebrew provenance of the Bagratid dynasty authored by Movses Khorenatsi, (410-490). As the modern historian Stephen H. Rapp puts it, "his history was an attempt to sum up the history of Georgia and to proclaim, for one last time, the divine sanction behind the Bagratids". Thus, the Bagratid claim to be descended from the Biblical David persisted until the Russian takeover of their thrones in the early 19th century and is held by some surviving Bagrationi today. The closest parallel to the Georgian Bagratid experience is that of Ethiopia. The medieval Ethiopian historical work Kebra Nagast claims that the Ethiopian rulers were the direct descendants of the Biblical Solomon's first born, Menelik. The Georgian and Ethiopian dynasties may have been aware of each other's claims; the Georgian Bagrationi Prince Ioann in his didactic encyclopedic novel Kalmasoba, written between 1817 and 1828, cites a 1787 letter sent by the Ethiopian emperor—"also descended from David the Prophet"—to Ioann's grandfather, King Heraclius II of Georgia, in which the Georgian monarch was reportedly addressed by his Ethiopian counterpart as "a beloved brother and the one related through the common bloodline". The Bagrationi's Hebrew or Davidic origin is considered by many as purely legendary and forged by the Georgian dynasty early in their history to help assert their legitimacy. The family's alleged Hebrew provenance was claimed to be utilized and elaborated by the Georgian Bagratids to claim the descent from the divinely appointed model Biblical King David, himself a descendant, in an unbroken line, of Adam and the ancestor of Jesus Christ. Notwithstanding, in the twentieth century, British historian, Steven Runciman, rehabilitated the theory of the Hebrew origin of the Bagratids. Runciman suggested that there was no reason to doubt their Jewish origin given the presence of Jews, fleeing from the Assyrian captivity, in Caucasia, "where, as in Babylonia, there were hereditary chiefs who claimed descent from David known as the 'Princes of the Diaspora', till the high Middle Ages". son of the anointed King Teimuraz, Heraclius the Second, King of Georgia, Kartli, Kakheti, ..."
God is a fire that warms and kindles the heart and inward parts. Hence, if we feel in our hearts the cold which comes from the devil - for the devil is cold - let us call on the Lord. He will come to warm our hearts with perfect love, not only for Him but also for our neighbor, and the cold of him who hates the good will flee before the heat of His countenance.